The "Ancient Library of Alexandria" was the largest and the most famous library of the ancient world. Unfortunately about 2000 years it was totally destroyed by a fire. In 1980s, the University of Alexandria floated the idea of reviving the Ancient Library and with support of Egyptian government, UNESCO, several Countries, private firms, organisations, NGOs etc. the construction work for the new library was started on May 15, 1995. 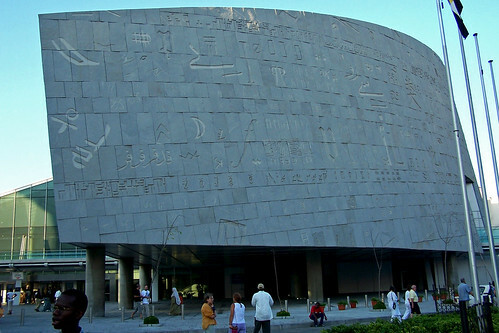 The new library which is almost at the same location where the ancient library stood, is known as "Bibliotheca Alexandrina". 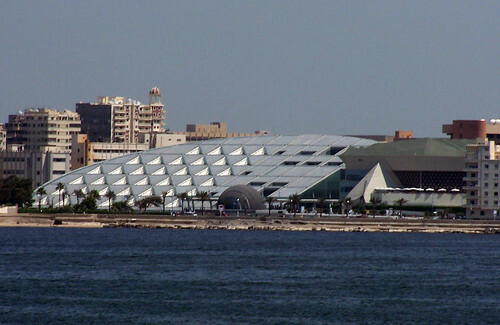 It was designed by Snohetta A.S. (Norway)/Hamza Associates (Egypt) and is considered a marvel of modern architecture. Officially inaugurated on Oct. 16, 2002 it received the 2004 Aga Khan Award for Architecture. 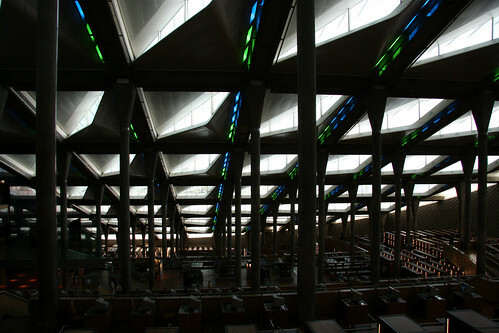 The main reading room of the library which is circular in shape, measures 160 metres in diameter and has a 32 meter high glass roof which is tilted out like a sundial. The building is 11 stories high but due to the slanting roof only 7 floors are visible outside and the other four are under ground. Its circular reinforced diaphragm wall, considered as largest in the world, was a major engineering achievement of that time. The wall is made of granite and displays letters (not words) from the alphabets of some 120 languages. The library has shelf space for eight million books. 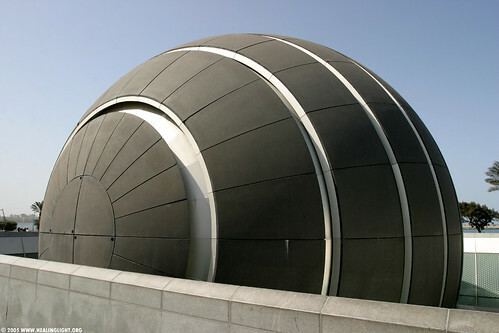 The complex also houses a conference centre; specialised libraries for the blind, for young people, and for children; three museums; four art galleries; a planetarium; and a manuscript restoration laboratory. Official Page of Bibliotheca Alexandrina. 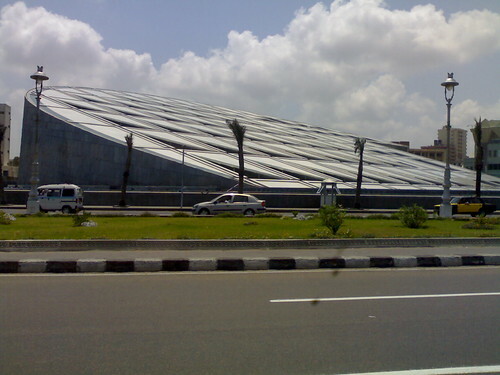 Incidentally Bibliotheca Alexandrina maintains the only external backup (Mirror Copy) of the Internet Archive which regularly takes a snapshot of World Wide Web and preserves, in digitised form, almost all the web pages created since 1996. 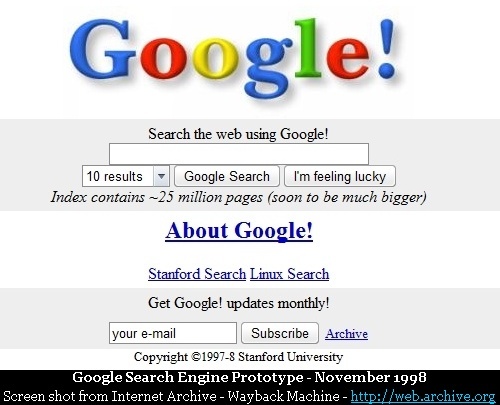 Although not related to the Bibliotheca Alexandrina, shown below is an interesting piece of internet history - which I found at the Wayback Machine of the Internet Archive. The round thing is the Planetarium Science Center at the Library complex. Thanks for asking. I will edit my post so that other readers also know about it.